Airwise works "outside the box", so it's not necessary for polluted air to actually enter the purifier. Instead, Airwise creates inductive warmth, drawing humidity into the purifier. 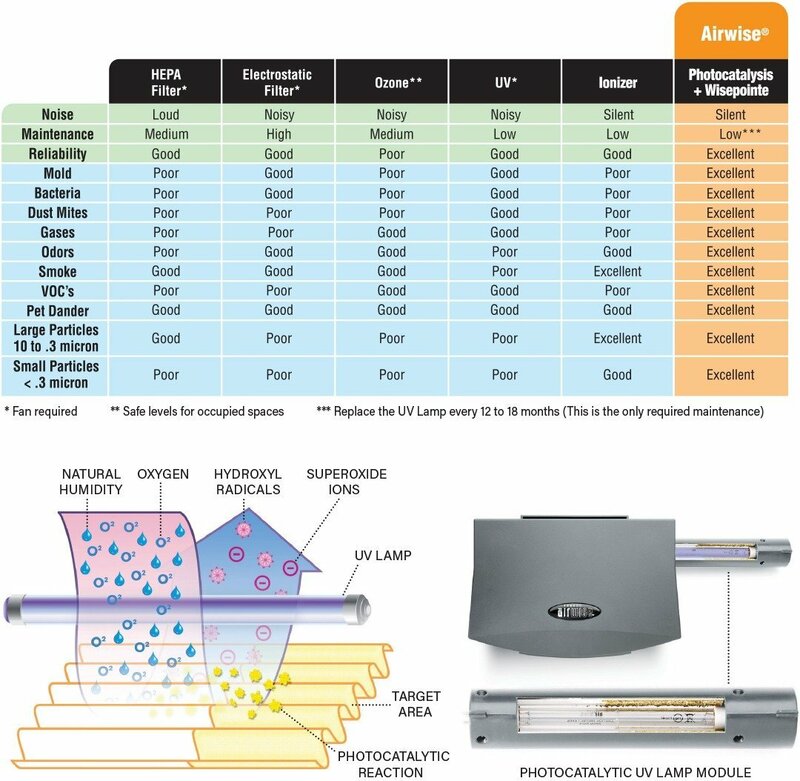 When humidified air enters the target area, the ultraviolet, germicidal lamp activates the catalyst to produce superoxide ions and hydroxyl radicals. These molecules then migrate throughout the area (will not go through walls or closed doors, but will go around corners) to neutralize toxins by breaking them up on a molecular level, destroying any micro- organism down to .001 micron. Wisepointe is the added benefit—increasing the speed at which particulate matter is taken out of your breathing space. Less than 1% of particulate matter measures more than 10 microns and is visible to the naked eye. Examples include pollen, ash, dander and aerosol mist. By contrast, over 98% measures less than 1 micron and would require a powerful microscope to be seen (a human hair averages 40 to 120 microns across). Some examples include fumes, viruses, mold and bacteria. The small size of these particles makes them detrimental to your health as they easily infiltrate the lungs. Compounding this is the fact that they tend to stay airborne, increasing the likelihood of ingestion. Microbes and Parasites These biological contaminants include bacteria, protozoa and fungi/mold, with a range of sizes from 0.001 to 10 microns. They rely on moisture and humidity to survive. Dust mites feed on decomposing skin and live and thrive in bedding. Some molds produce mycotoxins and volatile organic compounds (VOCs). Indoor gases, such as formaldehyde, chloroform, benzene, and hydrogen sulfide are released from furniture, carpeting, cleansers, printers, insulation, insecticides and hair sprays. VOCs, including benzene and trichlorethylene, contain carbon and easily evaporate into the air, making them readily inhalable. The odors that we all rather not smell are typically VOCs or other noxious gases.